Wayne Rooney finally scored in World Cup! He tugged the ball to Uruguay Nett following right back cross. 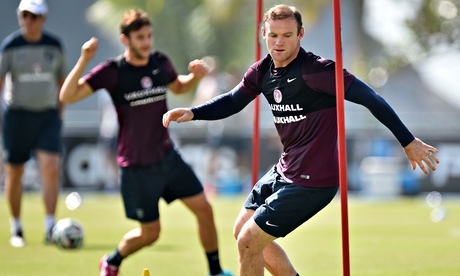 However the press of England still put pressure to Manchester United Striker. When England defeated by Italy 2-1 The England media said Roy Hodgson is mistaken by giving number 10 shirt to Colleen's husband. Why does England press loves to dramatize something? Gary Neville the assistant manager of England coach and former skipper of manchester united comment on the issue. He said Manchester United players would always get key role of drama created by England press. “This time it’s Wayne Rooney but that comes with the territory of being an important player in a big nation. I’ve never known there not be an obsession around one player. It was Gascoigne from 1996 to 1998, Beckham from 2000 to 2006. From 2006, it was Rooney and Beckham. Now it’s Rooney in 2014." I guess media in all over this planet is the same. They find one player who had ability and quality above other player and they worshipped him, make him so perfect that no other players could defeat him and you can depend on this player. England media seem to forgot that soccer is about team play, one big name cannot make great impact to the game. Cristiano Ronaldo and Portugal in this World Cup had show this, Cristiano Ronaldo cannot defeat Germany teamwork. I would be saying that media need someone to be the scape goat if England do fail to the next phase. "Unfortunately," as Gary Neville said to BBC "it's Rooney in 2014." As a fan of Manchester United and England soccer team I have hope England to progress to the next phase. I hope Rooney keep his high spirit and fitness so that he could prove to the England people that he works hard for the team and not just for his personal glory. Three points by beating Kostarika will be hard to get if the team getting pressure and I hope Gerrard as the Captain could be more positive leader in England bad situation. If I recall England matches against Italy and Uruguay, England defense is need to be fix. Second goal from Balotelli and The first goal from Luis Suarez made it clear that England is prompt to counter attack and crossing. As wing back goes in front to help England attack, center defender and devensive midfield need to cover the empty area left by Glen Johnson and Leighton Baines. Definetly Roy Hodgson have ideas in his head, he is an experience manager who will learn from matches the team had play.